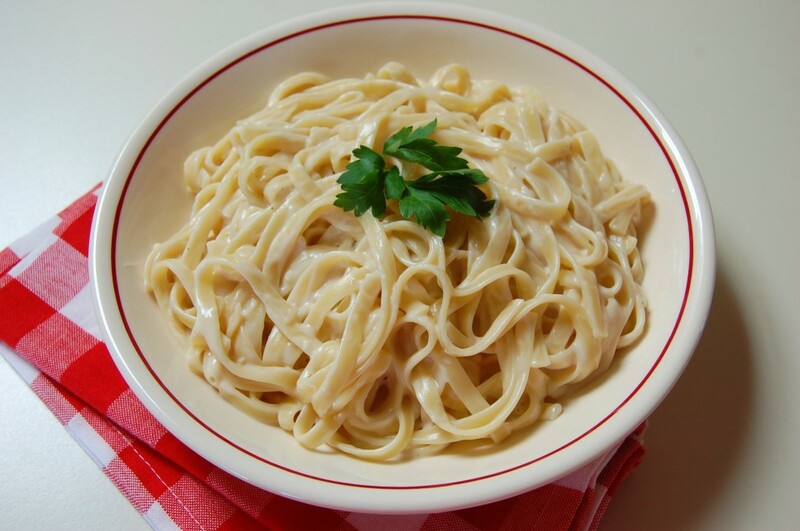 Rich, creamy, fettuccine noodles tossed with cream, butter, and parmesan cheese. Place butter in a large heat proof bowl. Using an electric mixer set on low speed beat until smooth. Add whipping cream and parmesan cheese. Stir until well blended, set aside. Bring a large saucepan of lightly salted water to a boil. Add pasta and cook according to package instructions. Drain well and immediately add the hot pasta to the butter mixture. 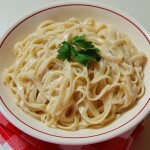 Using two forks, toss fettuccini in butter mixture to coat well. Add salt and pepper. Divide the pasta between 4 serving plates. Quickly slice the basil into shreds. Sprinkle over each serving. Serve immediately. Cook's Note: Stir in crispy bacon or pancetta and slice mushrooms, creating a hearty dish.